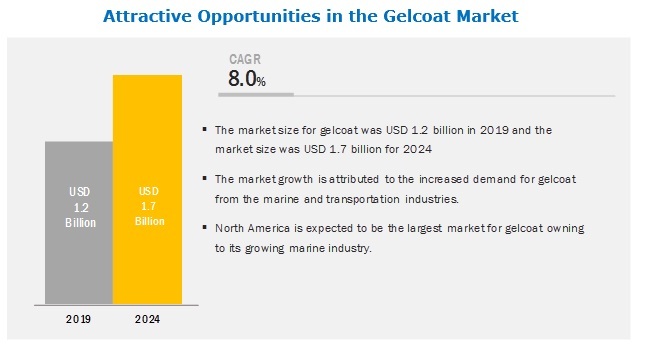 [130 Pages Report] The gelcoat market is projected to grow from USD 1.2 billion in 2019 to USD 1.7 billion by 2024, at a CAGR of 8.0% between 2019 and 2024. The market is growing due to the high demand from wind energy, construction, transportation, and marine industries. Marine is expected to the largest end-use industry of gelcoat between 2019 and 2024. Glass fiber reinforced plastics are widely used in the marine industry. Entire decks and complete ship hulls for powerboats or sailing/motor yachts are completely made up of high-quality glass fiber reinforced plastics. The use of fiber reinforced plastics increases the usage of gelcoat in the marine industry as gelcoat improves the aesthetic quality of fiberglass products and provides corrosion resistance to structural layered materials. Sunlight and harmful UV radiation lead to loss of gloss and color change. Therefore, the use of gelcoat in the marine industry needs to be based on its durability and resistance to sunlight and moisture. Gelcoat is used in various applications in the marine industry, such as yachts, boat hulls, boat decks, and hatches. Polyester resin accounted for a major share in the gelcoat market, in terms of both value and volume during the forecast period. Polyester is the most widely used resin for gelcoat. Polyester resin is easily available and has a low price. It also offers various useful properties such as resistance to water and chemicals and low shrinkage. These properties enable the polyester resin-based gelcoat to be widely used in the marine and construction industries. Polyester resins used in gelcoats offer durability to molds and parts. APAC is expected to lead the gelcoat market during the forecast period. APAC is a key gelcoat market. The booming transportation and construction industries are responsible for the growth of the gelcoat market in the region. China is one of the prominent consumers of gelcoat in the region. The country has become the single-largest consumer of gelcoat in the wind energy industry and is expected to strengthen its position further. APAC has a presence of major gelcoat manufacturers such as Satyen Polymers and Vikram Resins and Polymers. The gelcoat market comprises major solution providers, such as Ineos Enterprise (UK), Bufa Composite Systems GmbH (Germany), HK Research Corporation (US), Allnex (Germany), Scott Bader Company (UK), Poliya Composites Resins and Polymers (Turkey), Interplastic Corporation (US), Alpha Owens Corning (AOC) Aliancys (US), Polynt-Reichhold Group (US), and Turkuaz Polyester (Turkey). 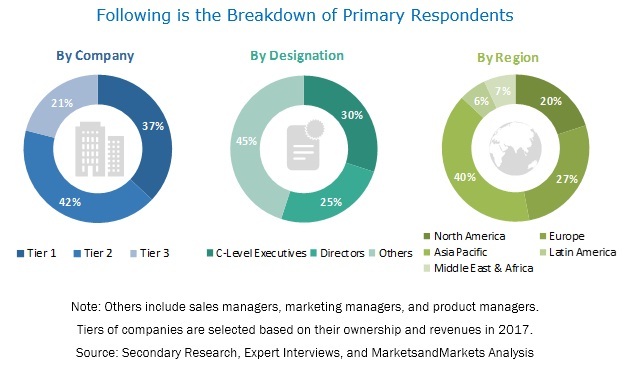 The study includes an in-depth competitive analysis of these key players in the gelcoat market, with their company profiles, recent developments, and key market strategies. Scott Bader Company is one of the prime manufacturers of gelcoat in the European region. The company possesses extensive product portfolio pertaining to gelcoats. It gives immense emphasis on the development of high-grade gelcoats for usage in various end-use industries. As a part of its growth strategy, the company is highly focused on expansions. For instance, in September 2018, the company expanded its presence in the Japanese market by opening a facility named Scott Badder Japan KK. In May 2018, Scott Bader Company entered into a strategic agreement with HK Research Corporation to enhance its R&D activities pertaining to gelcoats. In September 2018, Bufa Composite System GmbH developed a new conductive gelcoat, which is capable of eliminating electrostatic charges. It also increases the component quality. In November 2018, Ineos Enterprise entered into a definitive agreement with Ashland Inc. for taking over Ashland’s composite business segment that offers gelcoat. The agreement helped the company consolidate its product portfolio. Which are the major end use industries of gelcoat? Which industry is the major consumer of gelcoat? Which region is the largest and fastest-growing market for gelcoat? What are the major resins used in manufacturing gelcoat? What are the major strategies adopted by the leading market players? 11.11.7 Zhejiang Leader Composite Co., Ltd.
11.11.8 Changzhou Huake Polymers Co., Ltd.
11.11.9 Eternal Synthetic Resins (Changsu) Co., Ltd. The study involved four major activities to estimate the current market size for gelcoat. Exhaustive secondary research was done to collect information on the market, peer market, and parent market. The next step was to validate these findings, assumptions, and sizing with industry experts across the value chain through primary research. Both top-down and bottom-up approaches were employed to estimate the complete market size. Thereafter, market breakdown and data triangulation procedures were used to estimate the size of market segments and subsegments. The gelcoat market comprises several stakeholders such as raw material suppliers, processors, end-product manufacturers, and regulatory organizations in the supply chain. The demand side of this market is characterized by the development of the various industries such as marine, wind energy, transportation, construction and other industries. The supply side is characterized by advancements in technology and diverse applications. Various primary sources from both supply and demand sides of the market were interviewed to obtain qualitative and quantitative information. After arriving at the overall market size using the market size estimation processes as explained above, the market was split into several segments and subsegments. In order to complete the overall market engineering process and arrive at the exact statistics of each market segment and subsegment, the data triangulation and market breakdown procedures were employed, wherever applicable. The data was triangulated by studying various factors and trends from both demand and supply sides in the marine, transportation, wind energy, construction, and other industries. This research report categorizes the gelcoat market based on resin, end-use industry, and region.